It is vitally important that the Environmental Protection Agency rely on the best possible science to ensure that we have clean air and clean water. I believe that the EPA’s refusal to factor in the most recent science hurt our community’s efforts to fight TEP’s permit for the 10 RICE gas-fired engines. And now the EPA is proposing a new rule that would further restrict the agency’s ability to rely on the best available science! I recently received a response from the Pima Department of Environmental Quality regarding the public comments submitted on TEP’s permit to install the 10 RICE gas-fired engines in Tucson. 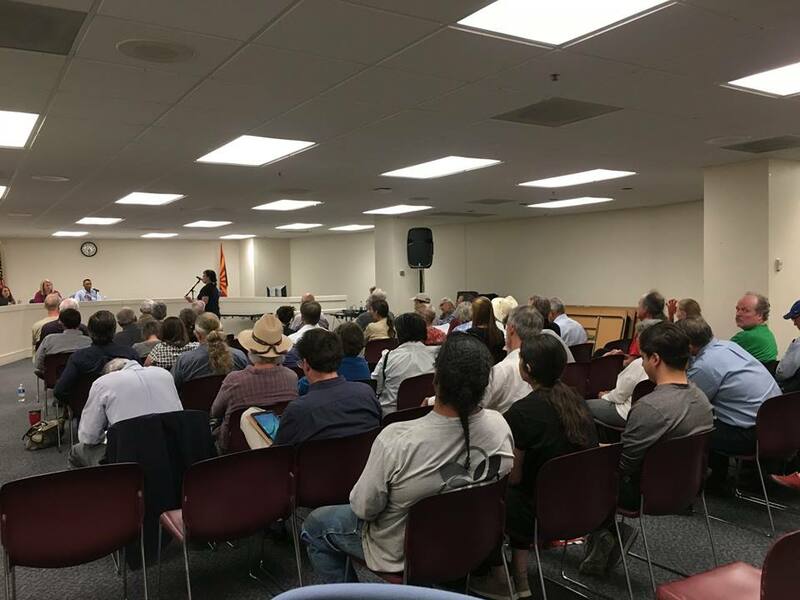 I want to thank the members of Sustainable Tucson, the Sierra Club, and other community members who took the time to go on record regarding this important issue. While our letters didn’t result in PDEQ rejecting TEP’s permit, we did slow down the process. (It took five months for them to review the comments and approve it.) And they did revise a number of permit conditions including: annual monitoring and reporting to provide reasonable assurance of compliance with the carbon monoxide emission limits for the RICE, and a condition that they would decommission the old generators before the new engines are installed. Within 30 days after service of this notice announcing the final permit decision, any person who filed comments on the proposed permit for the TEP Irvington Generating Station or participated in any of the public hearings for the TEP Irvington Generating Station may petition EPA’s Environmental Appeals Board (EAB) to review any condition of the final permit. One of the problems our community faced in responding to how TEP’s permit complied with PDEQ’s code was the absence of carbon dioxide standards. That’s right! The code doesn’t include carbon dioxide standards because Scott Pruitt put a hold on the Clean Power Plan. This is just one example of how vital it is for the EPA rely on the best available science when making decisions! Now the Environmental Protection Agency (EPA) has proposed a rule that would restrict the agency’s ability to rely on the best available science. According tho the Union of Concerned Scientist, this is nothing more than an attempt to undermine the EPA’s mission to protect public health and the environment. Our air, water, and health all rely on the EPA using the best available science in decision making. I am writing to express my objection to and concern about the Environmental Protection Agency’s (EPA) “Strengthening Transparency in Regulatory Science” proposal (Docket ID No. EPA-HQ-OA-2018-0259). I believe that science plays a pivotal role in ensuring our health and safety, preserving our environment, and informing evidence-based policy. This new proposal would undermine the EPA’s mission of preserving public health and the environment. For the EPA to utilize the best available science to shape public health and environmental safeguards, the agency needs to have the ability to use the best research and information. While this proposed rule promises “transparency,” it reduces confidentiality and privacy protections by requiring the raw data from these studies to be made public. Consequently, the best available scientific studies in numerous public health fields, where patient privacy prohibits sharing the raw data, would be sidelined. This arbitrary rejection of data from research on air quality, public health, drinking water, hazardous waste, and so many other fields would inhibit the EPA’s ability to implement science-based protections. When policies play a role in our health, safety, and environment, the EPA needs to use the best available evidence and research when finalizing safeguards. This ill-advised proposal would significantly limit the EPA’s ability to make the informed policy decisions that the agency is required to under landmark public health and environmental laws, including the Clean Air Act, Safe Drinking Water Act, and the Toxic Substances Control Act. I urge you to reconsider this proposed rule and withdraw it immediately. Please, share your story about how restrictions on science would harm your health and the environment. The more people who file comments, the less the EPA can ignore the weight of the evidence. Follow this link to the public comment page to submit your comment. Be sure to submit your comment by August 16 at 11:59 p.m., and check your email for a receipt confirmation. • Check out their helpful guide for writing a public comment. • Watch their Public Comments 101 webinar on making effective public comments to the EPA. While tending my desert garden, I became a sort of citizen scientist observing the impact of rising temperatures and declining rainfall in Tucson. I’m convinced we need to do everything we can to lessen the impact of climate change now. I share my journey to living a more sustainable lifestyle on my blog Sustainable Living Tucson. That includes blogging about what I have learned about sustainable practices like water-harvesting and clean energy. I am currently writing a play about Tucson feeling the impact of climate change. As a member of Sustainable Tucson’s core team, I help to organize programs on sustainable practices and environmental issues. I was invited to attend the Pima Department of Environmental Quality's Green Infrastructure planning meetings as a citizen advocate – after speaking up at City Council and Board of Supervisors meetings. Sustainable Tucson’s advocacy team recently fought the installation of 10 natural gas generators at the Irvington plant. I also rally my friends on social media to become active too by posting Calls to Action from my blog Desktop Activist Tucson.